Today we’re starting a new Blog Series which we’re going to come back to regularly. This new category for our blog is a chance to share some of our favourite recipes with you. When we work as postnatal doulas we’re all about looking after new families and especially new mums. One of the most important ways you can look after yourself and we can look after you is with good nourishing food that will help your body recover from the birth and give you energy as you get used to your new role as a mother. So our first two recipes are nourishing soup and broth recipes. These are really good for giving you healing and energy and great for making ahead and keeping in the freezer ready for when you’ve not got as much time for cooking. Soup is also good for the postnatal period because it’s easy to eat with one hand. This is the meat version click here to skip to a vegan version if you don’t eat meat. 1. Place everything in a large saucepan. 2. Simmer for 2-3 hours on low. 3. Strain. 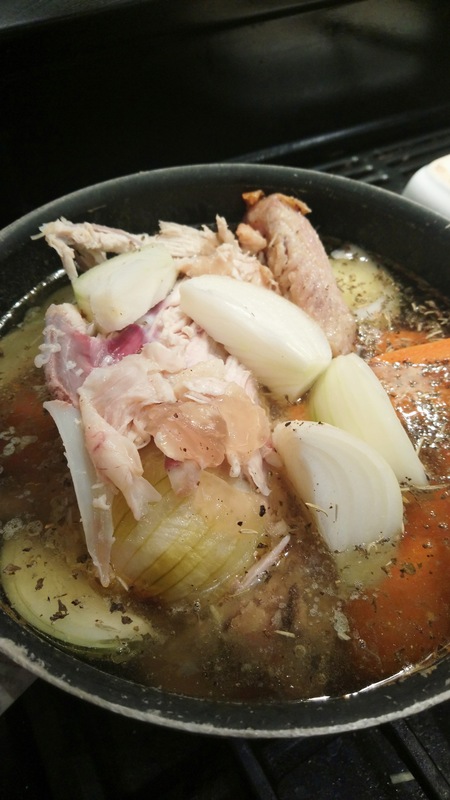 Discard bones and vegetables and use broth either as a drink or as a base to make other soups or stews.